They look like parrot feathers, party decorations, something somehow oriental and exotic, while in fact, sumac (yes a relative of poison ivy but this one won’t make you need an ocean of calamine lotion) is a common roadside weedy woody tree. But this time of year, they are far from common, and along with the Virginia Creeper (I’ve assigned myself the task of getting a portrait of same today) these are some of the earliest harbingers of the color change close upon us. Our five maples that have so nicely shaded our house all summer are in various stages of change, one almost at peak, another showing no noticeable color change though its leaves do look rather exhausted, and they all make a papery-empty sound now when the wind blows as they give up the good fight and prepare to find a place along our drive and yard and roadway. I’ll be posting “signs of fall” for the next few weeks. “Find me some signs of fall” we’d assign the kids when they were small, and they were off on the seasonal scavenger hunt that also included for credit smells, clouds and the feel on their skin. What are your signs of fall? Oh, keep posting those! Signs of fall around here are being able to go outside between 9am and 5pm and not having the breath sucked out of your body by the heat. 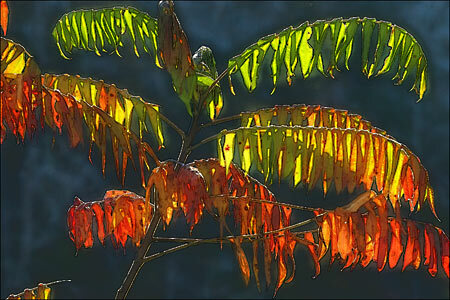 My ash trees don’t lose their leaves until December/January, and start growing their little pollen bits in February. That’s a stunning photo. I’m sorry you don’t provide a larger version! When I notice many Wooly Worms crossing the two-lane blacktop backroad I’m driving on. When I see lots of Grey Squirrels “packing” nuts into my yard to bury them here and there and using their foreheads to tamp them down before using their front paws to pull the grass back over the spot before they leave to gather another nut. When I see “V” formations of migrating ducks and geese, heading for their winter grounds. I know it is fall when I see a weather person showing the movement of the northern jet-stream as it wanders south, then creates a large horseshoe that incompasses my general area. I know it is fall when I go weeks at a time with the A/C off, all the windows in the house open and notice how great a light blanket feels at night. Then there are the obvious ones; when the air stops feeling spring and summer “soft” and takes on an “edge” I feel upon my skin. I also notice gusty breezes that always blow toward my house where those same breezes intend to deposit piles of leaves so deep I cannot manage to pick them up until the following spring. The unusual part of this happening is that I only have one tree on my property. When a flock of nighthawks wheels past, when flocks of grackles inhabit our woods, fall is in the air. when I can’t stop sneezing cause the ragweed is pollinating, vivid multi-colored sunsets, night skys are deep and chrystal clear, orion returns…..